In Still Life With Flowers, Ferris’s luscious abstraction gives way to a suggested bouquet of blinding white. 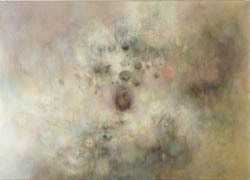 Set within flowing textures and translucent clouds, Ferris’s form creates the nostalgic ellusiveness of distant memory. Using the tactility of paint to voice emotional excess, Ferris’ canvases exude an uncomfortable disclosure, enhancing the awkwardly maudlin through their luridly poetic presence. Confronting the insincerity of media spun schmaltz, Ferris blissfully authenticates the most overwrought affections, her paintings conveying the hyper-reality of unadulterated feeling. 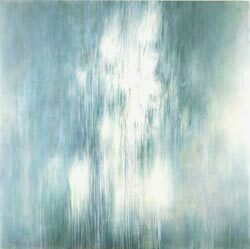 Presenting mere glimpses of her subjects, Ferris conceives painting as a platform for ambient communication: nebulous brushwork conveys the delicacy of heartfelt longing; her chimeric narratives are hinted through distant vaporous vignettes. 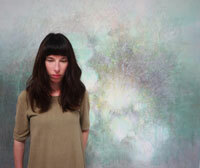 Using the tropes of melodrama, Dee Ferris’s paintings drip with an over the top sentimentality. Transcending kitsch, Ferris wittily uses cliché to describe emotional absolutes, validating the gushy and saccharine as genuine sensation. 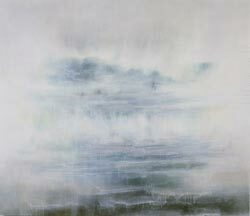 In This England, Byron-esque themes of poetry dance through the pearlescent mists of her canvas. White horses charge through the foggy English countryside, an almost filmic scene, celebratory of a lost heritage, as innocent and frivous as Fragonnard or Watteau. In White Wash, Ferris presents a scene of sublime romanticism worthy of Casper David Frederich. Almost entirely abstracted, just a hint of a figure can be seen, swallowed by the vast colour fields. Ferris’s work carries an embarrassed spirituality: the raw and cerebral power of paint shamelessly describing the decoratively sentimental. Revelling in the grandeur of its construction, White Wash presents landscape as idea rather than location: an artificial perfection boasting the supremacy of emotive desire over nature.